Human remains were found Saturday afternoon at Charleston Park, according to the Lee County Sheriff’s Office. Officials were called to the 23000 block of Avenue D in Alva where the remains were discovered, deputies said. Authorities have been combing through surrounding woods looking for clues for several hours. At this time, the sheriff’s office has not yet released the identity of the remains found, but neighbors are saying they know who the woman was. Neighbors say two teenage boys found the remains while they were looking for raccoons in their backyard. He quickly rushed to the closest house to tell his friend’s step father, Jerry Davis, what he had found. “And the minute I saw it I knew it was a murder–a grave,” Davis said. 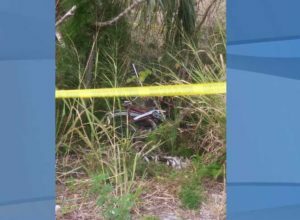 Shortly thereafter, the Lee County Sheriff’s Office confirmed they were human remains. “How could somebody be so heinous to do something like this and bring it to somebody’s backyard. A human is a human and all life deserves some respect,” Davis said. A WINK News viewer submitted this photo of a bike found near the area where the human remains were found.